Deck designers, builders, decking suppliers, manufacturers and installers get deck building jobs, order products and deck materials. 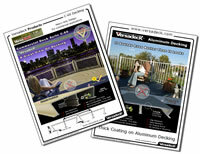 Access deck building plans and project management tools available for Versadeck's Dealer Network. Versadeck Decking builders and dealers are proud to offer the finest deck products and best value in the deck market with an alternative method of construction. Versadeck's thick comfort coated decking is available in plank, modular and waterproof decking that's combine-able creating the versatility to design the perfect outdoor deck solution. Send us your Resume or Contact Us to learn more, and join our growing network of Versadeck Decking Designers, Installers, Suppliers and Manufacturers.